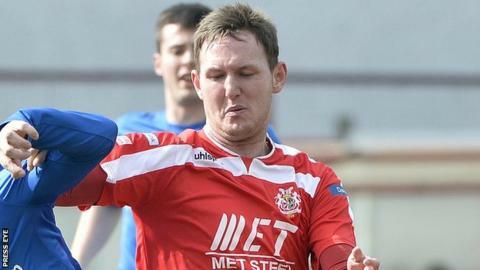 Premiership leaders Portadown are boosted by the return of striker Gary Twigg after injury for Saturday's game with Warrenpoint Town at Shamrock Park. Twigg has fully recovered from a hamstring injury and offers manager Ronnie McFall further options up front. Forwards Darren Murray and Mark McAllister have both shown good form for the Ports in recent weeks. Portadown are level on points with Ballymena United and mid-Ulster rivals Glenavon at the top of the table. Bottom side Warrenpoint, who are chasing their second league win of the season, are without midfielder Daniel Hughes. Ballymena skipper Allan Jenkins returns to the Sky Blues' squad after suspension for their match with Cliftonville at at the Showgrounds. Michael McNamee presents coverage of Saturday's Premiership action on Sportsound from 14:30 BST on BBC Radio Ulster. Grant Cameron will be joined by former Linfield manager to watch Ballymena United play champions Cliftonville at the Showgrounds. Michael Hammond and Scott Young are at Ferney Park for Ballinamallard's game with Linfield and there will be reports from the day's other three fixtures. Meanwhile Joel Taggart will provide regular updates from the Ryder Cup at Gleneagles, plus there will be news and opinion on the rest of the day's sport. Fellow midfielder Mark Surgenor serves a ban however after being sent-off in his side's County Antrim Shield win over Donegal Celtic in midweek, while Johnny Taylor is a fitness concern with a leg injury. The Reds, with only one league win in their last six league fixtures, hope to have goalkeeper Conor Devlin and defender Marc Smyth back within the next two weeks, but neither will be available for the trip to Warden Street. Glenavon have defender Kris Lindsay suspended for the visit to ninth-placed Coleraine following his dismissal in the victory over Linfield at Windsor Park last week. Another central defender, William Murphy, is doubtful with a hamstring injury, but Rhys Marshall, Kyle Neill, Ciaran Martyn and Eoin Bradley are available for selection after training this week. Bannsiders manager Oran Kearney has a doubt over Howard Beverland, who has sustained a head in jury. Linfield manager Warren Feeney must decide whether to keep faith with some of the players who saw off Dundela in the first round of the Shield in midweek, including hat-trick scorer Peter Thompson. The Blues will assess foot injury victim Jamie Mulgrew prior to their game at Ballinamallard and Feeney also has Monday night's rearranged game with Crusaders to consider. The struggling Mallards have doubts over defender Leon Carters and midfielder Cathal Beacom, who are both carrying knee injuries. Glentoran, with four draws from their last six Premiership encounters, are still missing injured defensive pair Barry Holland and Jay Magee. Dungannon, the visitors to the Oval on Saturday, have Abiola Sansui (calf), Sean McCashin (knee), Stefan Lavery (back) and Ryan Harpur (knee) all missing.